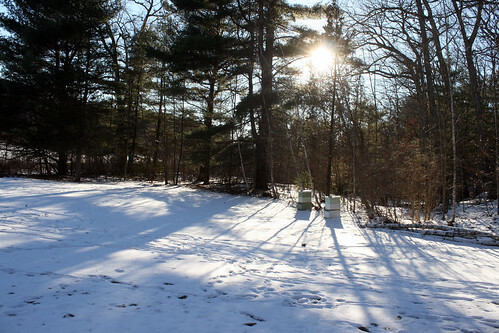 My bee hives are dwarfed by the long winter shadows. I'm wondering how the bees are doing. We've had a couple weeks of temperatures in the 20's and below. What a difference a month has made! At the end of December my bees were out pollinating hellebore. I prepared my hives for winter back in October by installing mouse guards, adding a piece of ceiling tile to insulate the top, and making sure my top entrance was available to the bees. I don't have entrance reducers on, but I do have a slatted rack bottom board, so hopefully that's keeping the draft down inside. It's the first winter for these bees and both hives were full to the top with honey and bees in the fall. My fingers are crossed. I'm thinking of starting a couple of hives this spring - I'll be interested to see how yours do through the winter.